Blom-Singer® voice prostheses are made of a silicone tube and one-way valve which help to maintain an essential passage between the trachea and the esophagus so that voice can be produced. Available in two styles, Duckbill and Low Pressure, and multiple sizes, Blom-Singer Voice Prostheses are designed to accommodate most anatomies. Custom sizes and side port are available on special order. Insertion sticks and instruction manual included with each prostheses. A full line of accessory items for Blom-Singer Voice Prostheses facilitates routine care and daily maintenance. The tracheoesophageal puncture dilator prevents the tracheoesophageal passage from closing upon removal of the voice prostheses. For users of the 16 Fr. prostheses, use an 18 Fr. dilator; for users of the 20 Fr. prostheses, use a 22 Fr. dilator. The Gel Cap Insertion System enables smooth, easy insertion of Blom-Singer Low Pressure Voice Prostheses into the tracheoesophageal passage. A new flushing pipet allows the voice prostheses to remain in the tracheoesophageal passage while performing routine cleaning. 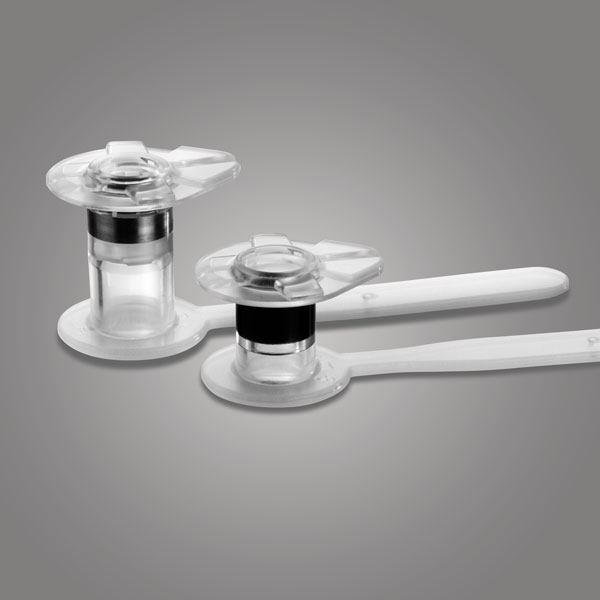 Click here to view InHealth’s entire line of Blom-Singer products.